Happy Saturday! It is a gorgeous day here in Texas..finally cooling off a bit! Hey, anything less then 95 degrees is a sign that fall is approaching here. For some reason I woke up UBER early today. I decided to get moving, take my little "pupster", Ozzy, for a walk (it was 77 degrees this morning...YAHOO!! ), then snag a little "creative time" while I had it. 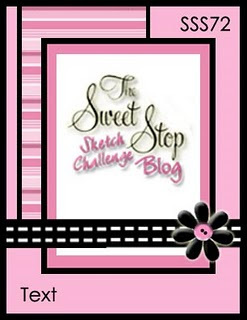 While searching for a sketch to pair up with this delicious color mix, I came across The Sweet Stop blog this morning (kind of ironic, don't you think?). As soon as I saw this sketch I IMMEDIATELY knew what I wanted to do. I love when that happens, when an idea just "clicks". Oh, and since I was so inspired, look what made their way into our house this afternoon...BROWNIES! Soooo yummy! Ozzy and I have a few more walks in our future because of them, but they were SO worth it! Yummy, ok both brownies and card:)I agree on the weather, it was so beautiful out and so nice not to sweat at 7AM. Your card is great, love the ribbon and brads on the side and the twine with the button, the whole card says fall! Have a great weekend. Gorgeous card Anne Marie!! I love the color choices and your take on the sketch is beautiful! I love the colours you've used on this card. Beautiful project - not long till we in the UK have the same color choices as you and I can join in the challenge! And those brownies look YUMMY - my favorite sweet thing in the world! I just love this set. Mostly because of the image you used. It looks great in this color combo. I like your ribbon/button/twine accent. Ohhhhhh ::: hand out for a Brownie! :::: tee hee! Those look quite yummy! I used to live in San Antonio and I tell ya, I dont' remember it ever cooling off, lol! Bless your heart! Your card is fabulous! What a neat color palette - and super sweet stamped flowers. Love it!